No formal published information from the state. The site where the village of Buffumville was established was first developed as a mill in 1812. The 183-acre tract was situated in both Oxford and Charlton. In that year, brothers Alexander and Jonathan Nichols built a dam and sawmill on the Little River. In 1815, they built a two-story house, and in 1818, a gristmill. Moses Buffum, a successful miller and businessman, was born July 10, 1800 at Smithfield, Rhode Island. He began a hat making business in Slatersville, Massachusetts at the age of 18, and soon became a part-owner of a satin mill in Millville, Massachusetts. He became the sole owner in 1834, and continued to enlarge his business until his mill burned in 1849. In 1852, Moses Buffum relocated to Oxford, Massachusetts and bought the mill on the Little River to manufacture cassimere (fine woolen goods). Because Mr. Buffum became a prominent and well liked business man, the community around his mill became known as Buffumville. Located in Charlton and Oxford, this 451-acre impoundment resulted from an Army Corps of Engineers Flood Control Dam. 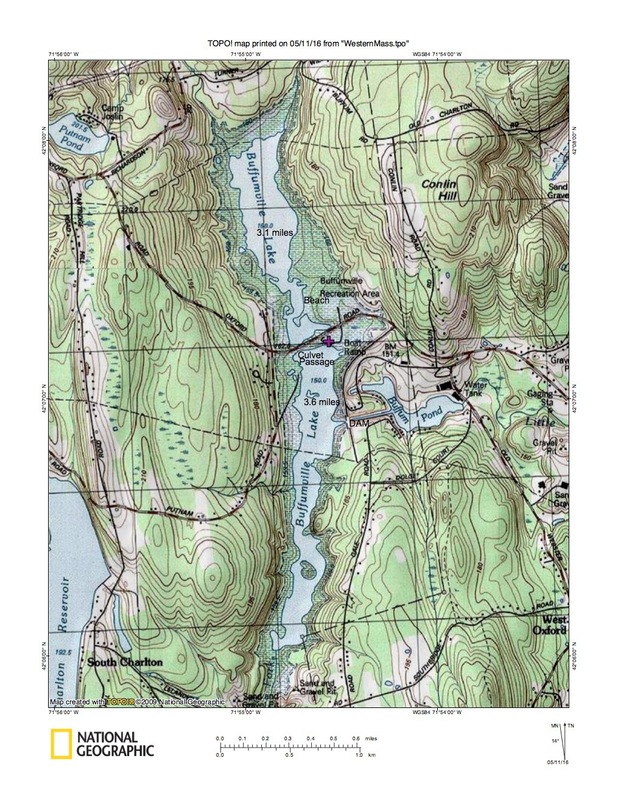 Putnam Road bisects the reservoir into a 265-acre north basin and a 186-acre south basin. Dark watercolor limits the transparency to 5.5 feet. Aquatic plants are common, particularly along the western shoreline. Milfoil, pickerelweed and sedges are abundant in the southern basin, common in the northern basin. The eastern shore of the southern basin is dotted with clusters of submerged tree stumps and standing dead trees. Boats (trailers and car-top) can be launched at the north end of the south basin off Putnam Road. A culvert large enough to accommodate passage of most sport fishing boats connects the two basins. 8 species: largemouth bass, chain pickerel, yellow perch, white perch, bluegills, black crappie, white sucker and brown bullheads. At the end of the ramp head west on Sutton Ave.
At mile 0.5, continue onto Charlton Street. At mile 2.7. continue onto Oxford Road. The U.S. Army Corps of Engineers welcomes you to Buffumville Lake for year-round recreation. Park rangers are available to assist you during your visit. The disc golf course at the Buffumville Dam site has 18 professional holes and 12 amateur holes for golfers of all ages. The 7.2 mile Lake Shore Trail starts in the park and extends around the shoreline of the lake. The trail is marked with blue blazes. Park rangers provide special interpretive programs on topics to include natural recourses, water safety, and Dam tours. Buffumville Park is open daily from mid-May through mid-September. The park is a day use fee area containing picnic sites with tables and grills. The Corps maintains a swimming area with a 300 foot long beach. This areas includes two picnic shelters that may be reserved for a nominal fee (through www.recreation.gov), a life jacket loaner station, horseshoe pit, volleyball court and a handicap accessible comfort station. See below for pricing details. The outdoor sports enthusiast can hunt, fish and boat at Buffumville Lake. Hunting is not permitted in developed areas of the park and dam site. A concrete boat launch and culvert underneath Oxford Rd. permits boating on both sides of the lake. The launching land and courtesy dock provide easy access to the lake. Two barrier free fishing platforms are available within the boat launching area. The use of watercraft including motorboats, canoes, kayaks, and other vessels is permitted. The three-acre island on the south end of Buffumville Lake is available to rent (primitive camping) for up to one week. The island is extremely primitive with four tent sites, a fire ring, wood shed, picnic tables, and an outhouse. Permitees must have a boat to reach the island. Reservations for the island start on January 1 of each year, beginning at one minute after midnight. Email us or leave a detailed phone message and you will be registered according to the time your message comes in. See below for pricing details.